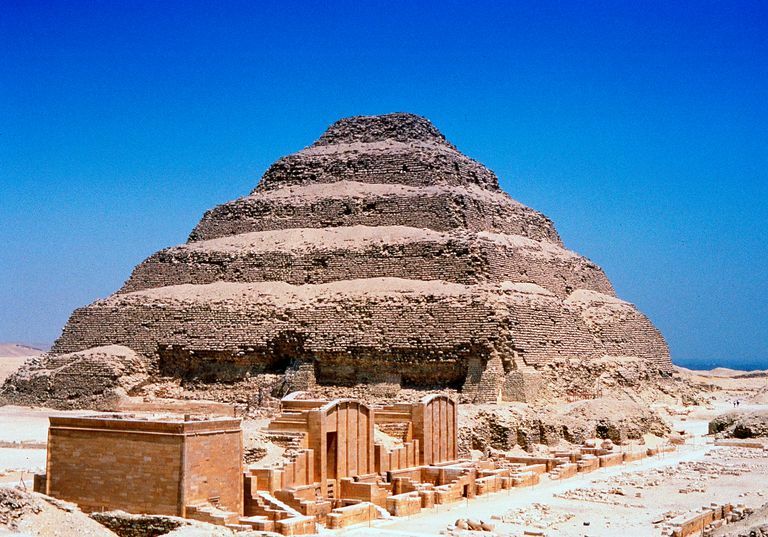 The Step Pyramid of Djoser (also spelled Zoser) is the earliest monumental pyramid in Egypt, built at Saqqara about 2650 BC for the 3rd Dynasty Old Kingdom pharaoh Djoser, who ruled about 2691-2625 BC (or perhaps 2630-2611 BC). The pyramid is part of a complex of buildings, said to have been planned and executed by that most famous architect of the ancient world, Imhotep. What is a Step Pyramid? The Step Pyramid is made up of a stack of rectangular mounds, each built of limestone blocks, and decreasing in size upward. That may seem odd to those of us who think "pyramid-shaped" means smooth-sided, no doubt because of the classic Giza Plateau pyramids, also dated to the Old Kingdom. But stepped pyramids were the common type of tomb for both private and public individuals until the 4th dynasty when Sneferu built the first smooth-sided, albeit bent, pyramid. Roth (1993) has an interesting paper about what the shift from rectangular to pointy pyramids meant to Egyptian society and its relationship to the sun god Ra; but that's a digression. The very first pharaonic burial monuments were low rectangular mounds called mastabas, reaching a maximum height of 2.5 meters or about eight feet. Those would have been almost completely invisible from a distance, and, over time the tombs were built ever-increasingly larger. Djoser's was the first truly monumental structure. Djoser's Step Pyramid is at the heart of a complex of structures, enclosed by a rectangular stone wall. The buildings in the complex include a line of shrines, some fake buildings (and a few functional ones), high niched walls and several 'wsht' (or jubilee) courtyards. The largest wsht-courtyards are the Great Court south of the pyramid, and the Heb Sed courtyard between the rows of provincial shrines. The step pyramid is near the center, complemented by the south tomb. The complex includes subterranean storage chambers, galleries and corridors, most of which were not discovered until the 19th century (although they were apparently excavated by Middle Kingdom pharaohs, see below). One corridor that runs beneath the pyramid is decorated with six limestone panels depicting King Djoser. In these panels Djoser is dressed in different ritual clothing and posed as standing or running. That has been interpreted to mean he is performing rituals associated with the Sed festival (Friedman and Friedman). Sed rituals were dedicated to the jackal god known as Sed or Wepwawet, meaning Opener of the Ways, and an early version of Anubis. Sed can be found standing next to Egyptian dynastic kings right from the first images such as that on the Narmer palette. Historians tell us that Sed festivals were rituals of physical renewal, in which the aged king would prove he still had the right of kingship by running a lap or two around the walls of the royal residence. Djoser's name was given to him in the Middle Kingdom: his original name was Horus Ntry-ht, glossed as Netjerykhet. All of the Old Kingdom pyramids were the focus of keen interest to the founders of the Middle Kingdom, some 500 years after the pyramids were built. The tomb of Amenemhat I (Middle Kingdom 12th dynasty) at Lisht was found to be packed with Old Kingdom inscribed blocks from five different pyramid complexes at Giza and Saqqara (but not the step pyramid). The Courtyard of the Cachette at Karnak had hundreds of statues and steles taken from Old Kingdom contexts, including at least one statue of Djoser, with a new dedication inscribed by Sesostris (or Senusret) I.
Sesostris (or Senusret) III [1878-1841 BC], Amenemhat's great-great grandson, apparently snagged two calcite sarcophagi (alabaster coffins) from the underground galleries at the Step Pyramid, and transmitted them to his own pyramid at Dahshur. And, according to recent article by Zahi Hawass, a rectangular stone monument featuring the undulating bodies of snakes, perhaps part of a ceremonial gateway, was removed from Djoser's pyramid complex for the sixth dynasty Queen Iput I's mortuary temple at the Teti pyramid complex. This article is a part of the About.com guide to Ancient Egypt, and the Dictionary of Archaeology. Baines J, and Riggs C. 2001. Archaism and Kingship: A Late Royal Statue and Its Early Dynastic Model. The Journal of Egyptian Archaeology 87:103-118. Bronk Ramsey C, Dee MW, Rowland JM, Higham TFG, Harris SA, Brock F, Quiles A, Wild EM, Marcus ES, and Shortland AJ. 2010. Radiocarbon-Based Chronology for Dynastic Egypt. Science 328:1554-1557. Dodson A. 1988. Egypt's first antiquarians? Antiquity 62(236):513-517. Friedman FD, and Friedman F. 1995. The Underground Relief Panels of King Djoser at the Step Pyramid Complex. Journal of the American Research Center in Egypt 32:1-42. Gilli B. 2009. The Past in the Present: the Reuse of Ancient Material in the 12th Dynasty. Aegyptus 89:89-110. Hawass Z. 1994. A Fragmentary Monument of Djoser from Saqqara. The Journal of Egyptian Archaeology 80:45-56. Pflüger K, and Burney EW. 1937. The Art of the Third and Fifth Dynasties. The Journal of Egyptian Archaeology 23(1):7-9. Roth AM. 1993. Social Change in the Fourth Dynasty: The Spatial Organization of Pyramids, Tombs, and Cemeteries. Journal of the American Research Center in Egypt 30:33-55.